This provider was a pleasant surprise for us and it beats most major players in every possible way, from speed to know-how. VPN.ac is VPN service based in Romania, operated by a security company, Netsec Interactive Solutions. Let’s see how they compare with the competition. Review Update (September 19, 2014): A couple of weeks ago, VPN.ac introduced support for Elliptic Curve Cryptography with OpenVPN. Another important addition is obfuscation support to better by-pass DPI in China and other countries where most VPN protocols are blocked. Review Update (June 14, 2015): We included VPN.AC SecureProxy in our Alternatives to Hola article. Review Update (August 19, 2016): new speed tests and geo-blocking testing. VPN.ac has over 70 servers in 20 countries: Australia, Canada, Switzerland, Germany, Spain, Finland, France, Hong Kong, Italy, Japan, South Korea, Lithuania, Luxembourg, Mexico, Netherlands, Poland, Romania, Sweden, Singapore, UK and USA. There are multiple servers in some countries, for example in Netherlands they have 13 servers and in USA they have around 20. They offer a single VPN plan that allows up to 6 simultaneous connections using OpenVPN, L2TP/IPsec and PPTP as well as their SecureProxy addon for browsers. Their VPN servers provide 128-bit and 256-bit encryption with OpenVPN and 256-bit with L2TP/IPsec. P2P is allowed in all locations, but they have some “optimized” locations for P2P: Netherlands, Canada, Sweden, Finland, Romania, Luxembourg and France. In January 2014 vpn.ac upgraded their OpenVPN encryption to 4096-bit RSA keys for authentication and AES-256-bit cipher for data transfer. OpenVPN also features hourly PFS (Perfect Forward Secrecy). 9 months later they introduced support for Elliptic Curve Cryptography, an upgrade to RSA – quite an unique feature in the market. Another feature they introduced in early 2014 is their Private DNS Resolvers: instead of using 3rd party DNS servers like Google or hosting providers, who transmit DNS queries in clear-text, vpn.ac deployed their own DNS resolvers and all DNS queries are encrypted between the customers and the resolvers using AES 128-bit. On the resolver servers, they run a service that is generating millions of DNS queries which are mixed with the queries received from VPN users, this way making the resolvers pretty much immune in case of DNS query sniffing. Their SecureProxy extension for Chrome, Firefox and Opera allows the users to tunnel the browsing traffic without connecting to VPN in a classic way (OpenVPN, L2TP/IPsec etc.) using strong encryption. The extension is using pure TLS traffic so it’s very good in bypassing firewalls and ISP censoring in China. Currently, their SecureProxy addon has multiple gateways in USA (8 servers on West Coast, 4 on East Coast, 1 in Central US), Japan (6 servers), Hong Kong (2 servers), South Korea, Singapore (2 servers), India, Australia, Canada (Vancouver and Montreal), UK (3 servers), Ireland, Germany (2 servers), Austria, France, Hungary, Netherlands (2 servers), Finland, Norway, Czech Republic, Russia, Switzerland, Sweden, Italy, Bulgaria, Ukraine, Lithuania, Poland, Mexico, Denmark, Spain, Portugal and Romania. They had a L2TP/IPSEC dialer at the time we wrote the first review. On January 2014 they released a proprietary VPN software for Windows and Mac. The software is light, clean and doesn’t require installation on PC, it is compatible with all their VPN protocols, has a list of locations and connection ports to choose from, displays their latest news, connection status including IP address. The software is available for Linux too, in beta. Downloading, running the software and connecting to a server took us less than a minute. 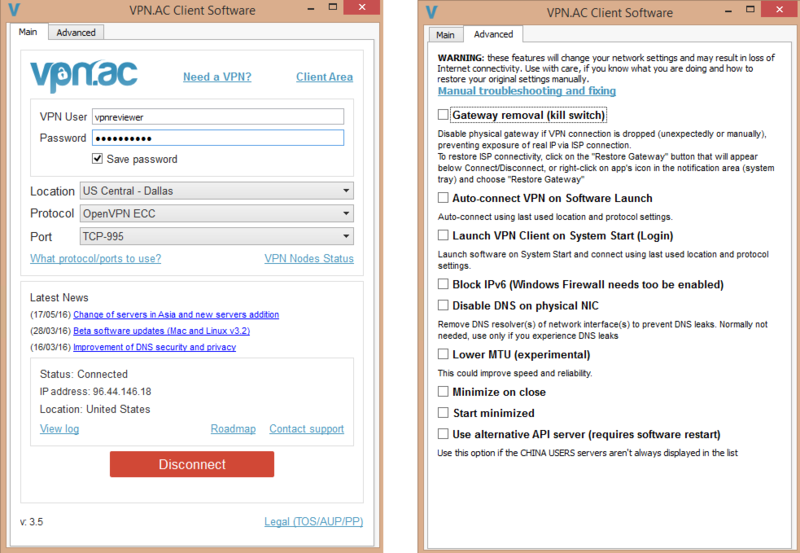 A VPN software for Mac is also available and it is a precise “clone” of their Windows version. Software version 3.5 has built-in support for Kill Switch, DNS leak protection, IPv6 leak protection, auto-start and auto-connect. A proprietary software is also available for Android, using OpenVPN with Elliptic Curve Cryptography and AES-128 for data channel. What’s really nice about their Android VPN app is that allows the user to exclude apps from using the VPN. This feature comes handy for those who don’t want all their traffic to go through the VPN, but only some apps. 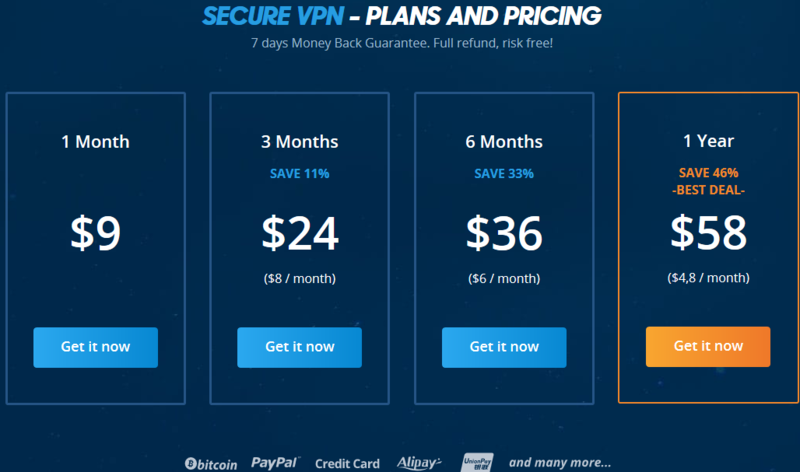 Their monthly VPN plan is $9 and discounts are available for their 3, 6 and 12-month plans: $24/3 months, $36/6 months and $58/year. They provide a $2 trial account for one week. You can cancel your subscription in the first 7 days to get a full refund. Payment methods include Paypal, Bitcoin, Credit Cards, AliPay, Perfect Money, gift cards and many more. At the end of this review you will find an exclusive 30% OFF recurring discount code. Do you log my activity? We DO NOT log/monitor user activity such as web-sites you visit, emails, instant messages etc. We need to keep some connection (to our VPN service) logs for support and debugging purposes. Connection logs are kept on a separate, encrypted server (located in a non-disclosed location) and are automatically erased on a daily basis. 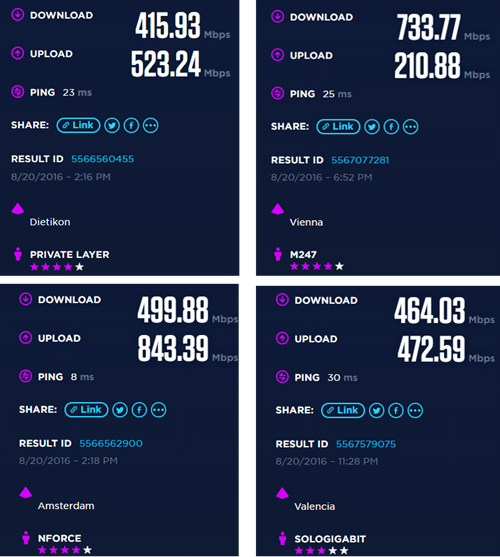 We were impressed with their speed, reaching over 100 Mbps, even 300+ Mbps connecting to the VPN. That’s better than our testing results with other VPN services. The speed results above were reached connecting with OpenVPN and IPsec. In terms of reliability, we had OpenVPN connections running for up to 3 days without disconnecting, so we cannot complain. The IPSec connection wasn’t as stable as we would have liked, and it disconnected us twice in a full day of testing. 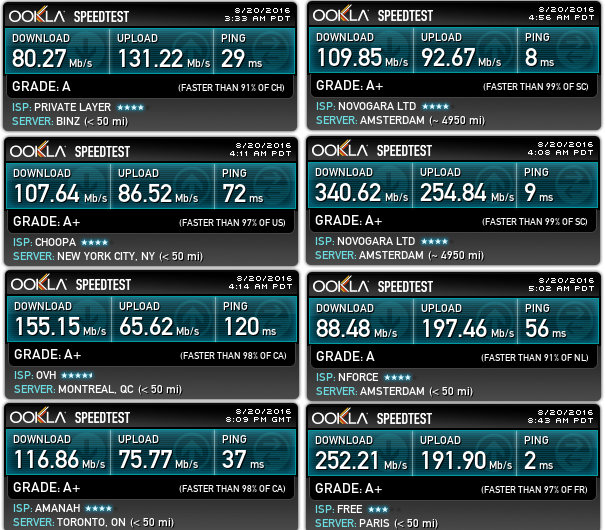 We also tested the speed with their SecureProxy browser addon and it beats other browser VPNs by a mile! In our tests we also noticed that Netflix, BBC iPlayer, Hulu and some other streaming services aren’t blocked. They are working with all their locations. During our time with VPN.ac, we opened two tickets and both were answered in a helpful manner before we went away from the ticketing page – literally. They also run a live chat and we used it to ask for a few technical details about their service. According to their FAQ page, support is provided by themselves and not by a 3rd party. Excellent speeds. Could this be because their servers are not overused yet? Only time will tell. Fast and insightful support assistance. An innovative company, not just “yet another VPN”: the first in the industry to encrypt DNS queries, one of the very few to support Elliptic Curve Cryptography. VPN service backed by a security company so one would expect them to keep their servers secure (they provide security testing services). Very good, light VPN software for Windows, Mac, Linux (beta) and Android that gets the job done. Lots of OpenVPN connection types available, good mix of obfuscation types, strong encryption parameters and ports. SecureProxy extension for Chrome and Firefox is very good if you want to secure only the browsing traffic. And it’s lightning fast! Clean and informative website. Includes a Roadmap page where they give info on what’s under development and what they are working on and privacy/security tutorials. Netflix, Hulu, BBC iPlayer and a bunch of other streaming services are working via all their locations. Ideally, we would like to see VPN servers in more countries. No proprietary VPN app for iOS yet. Software isn’t open-source but they plan to release it. No support for HTTP or SOCKS5 proxies which come handy for torrenting. This provider was a pleasant surprise for us. The entire testing process (account activation, VPN setup, speed and reliability tests, feature-gathering from their website) was a straightforward one. Their servers are very fast and reliable, pricing is good, and support is friendly and very knowledgeable. Software is very light and doesn’t require installation on PC: not the average software that’s adding stuff all over the place, from Program Files to registry. Bearing all this in mind, we give vpn.ac a rating of 8/10 and highly recommend it. 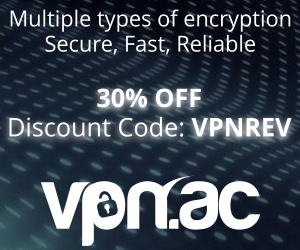 Should you decide to sign-up with them, use the vpn.ac discount code “VPNREV” for 30% OFF recurring discount. I can confirm that they are great. I’m using vpn.ac since July for light p2p and streaming and never had any problem. Extremely competent support, best experience ive had with vpn company so far (cause things will break and you will have to deal with support with any vpn). one of the only vpn’s that actually can get openvpn on dd-wrt to work. Does this company contact you if they receive a letter or notice from the DMCA? I have never heared about something like this. I am a relative new user to vpn.ac and I really love them. They are small, (more) skilled than others and have a good speed. Awesome service. I tried 10 other VPN services before settling with VPN.AC. Small company dedicated to true security. Great speeds, encrypted dns and when you need support you speak directly to one of the engineers. With current coupon code I paid $40.60 for a year of service! Currently running on my DD-WRT router like a champ. amazing support indeed and a very reliable service. No question these guys are the best at what they do! I’m with them since September and already love the service. It’s very fast and the last feature they added allows access to Netflix and other streaming sites even when connected overseas. Incredibly knowledgeable and quick support. Best service I ever used, period. I’ve done some research on recommended VPNs to use in China and found these guys on some other site. It’s been very good, not blocked for most of the time. Speed is good and I can watch Netflix when connected to their servers in Japan. I’ve been with them for over 6 months, using the service in China. It works very well, speed is good most of the time. On mobile it is hit and miss, but their Chrome extension on PC is absolute brilliant and I don’t notice any slow downs. excellent speed! I rarely notice more than 10% drop off my regular 75mb ISP speed in Germany. upload on my 125 download and 12 upload speed. I’m using their service each day since early 2014 and I never had any problem. I have a lot of respect for the service and it works better than any other VPN service I’ve tried. Very skilled support, speed comes on par with my ISP line all the time (7MB/s), software isn’t bloated and works perfectly on Mac and my Nexus 5. Can i play game with this vpn , even at my work network? I can also confirm that vpn.ac is great! Love there knowledge and their secure protocols. They do not have a live chat but a ticket center, which save their (and our) money. You will see it when you have a bigger and deeper question, they answer in an intelligent and serious way, not a cheap outsourced service center. I trust in vpn.ac but would also like to have more countries (India would be very nice for me). customer for 2 years now. Service is outstanding. I’m researching purevpn alternatives and this one looks very promising. I intend to use the service on a windows phone and a pfSense router. Do you know if it’s supported? Yes. They have a tutorial for pfSesnse and Windows phones are compatible with IPsec/L2TP connections. I have found this review site while researching for good and reliable VPN service so I tried VPN.ac one-week trial subscription. I experienced problem connecting to my favourite streaming site and online support responded to me in three hours also letting me know that they’re fixing the problem. What an excellent service to a prospective customer, so I joined VPN.ac for 1-year subscription! Newer user of VPN.ac service. I have tested a number of the bigger name services, such as N***VPN. They left me unimpressed. So far I am very satisfied with VPN.ac and signed up for a year. Never had a problem in 2 years. Incredible speed and 4 hops VPN with the Secureproxy browser addon. It just puts all competition behind. you should make an update of the vpn.ac review. Service has been great for many years since I’m a user and they added new features, new servers constantly since this review was last updated. I’m looking forward for their support for wireguard in the near future. Really great service. fully agree to bliss’s comment. The service is great and they made so many changes since this review was made. Lots of new locations, software improvements, an app for Fire Stick and Android TVs. Also they are going to provide support for WireGuard VPN protocol soon. +1 to last comments. This great service needs an up to date review. This service is very good and I use it since 2017 along with my own Wireguard server. They recently announced Wireguard support coming in February. Can’t wait to give it a go! Just an update for anyone interested. They just added support for WireGuard last week and it’s working incredibly well. Much better experience on mobile than OpenVPN. Even though it’s still beta and they announced that many changes are going on, I haven’t had a problem in the past days. There are 15 locations available now and they are going to add a lot more. Highly recommended service!